A tangy, crunchy topping or side ready to go in 30 minutes! 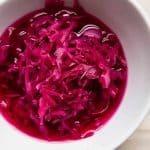 This quick pickled red cabbage is the great on top of tacos, sandwiches or to put on a cheeseboard for a pop of color and balance of acidic taste! Set 2 to 3 cups of water to boil in a kettle or a sauce pan. In a container with a lid, like a mason jar, add vinegar, sugar, salt and any spices if you choose. Stir to combine. Place the sliced cabbage in a colander. Once the water is boiling, pour slowly over the cabbage until all the water is gone. This can be done over the sink or over a large bowl. Transfer the red cabbage to the container with the vinegar mixture. Let sit for 30 minutes before using. Flavor will develop and the harshness of the vinegar will mellow the longer it sits. Store covered in the refrigerator up to 3 days.